Our latest design project has just launched and I couldn’t be more excited to be part of this fantastic one of a kind initiative! Kilkenomics has teamed up with Mike Driver of Convex Capital to offer a possibly life changing investment for Irish companies. I can’t wait to tell you more about this project over the coming months but do check it out and if you are part of a company that is looking for some guidance and support along with an investment check it out to enter your pitch on our newly designed website (so you can guarantee the application process will be a breeze). 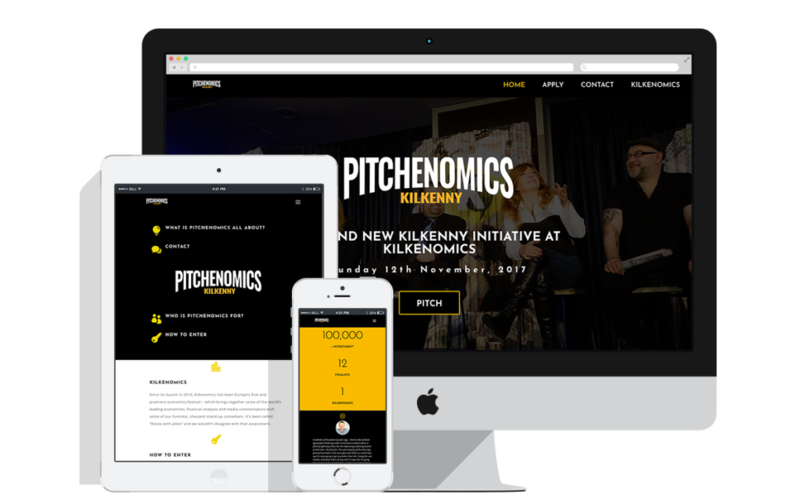 Pitchenomics is a brand new Kilkenny initiative in conjunction with Kilkenomics is offering Irish startups and existing small; large and medium companies an opportunity to fast-track their business through investment and will be offering this potentially-life-changing opportunity at this year’s Kilkenomics Festival Nov 9 – 12th, 2017. 12 companies selected by the open programme will pitch their companies at the tech event, with the winners receiving investment between €10,000 and €100,000 in their companies and open up access for the companies to a vast network of investors, coaches, mentors and customers.